Well, since I’m re-playing the original “Quake” at the moment and I’m only just noticing how Lovecraftian it really is (since I first played it long before I’d even heard of Lovecraft), I thought that I’d write an article about writing Lovecraftian fiction. In case anyone has never encountered this genre of fiction before, it is a sub-genre of horror/dark fantasy fiction inspired by the works of H. P. Lovecraft. Whilst Lovecraftian fiction doesn’t necessarily have to involve any direct references to Lovecraft’s stories, it should be written in a similar style and evoke a similar atmosphere to Lovecraft’s stories. 1) Read H.P.Lovecraft: If you’ve read this far into the article, then I guess that you’ve probably done this already. But, if you haven’t, then either find a book of his short stories or just go over to Wikisource or Project Gutenburg and read the Lovecraft stories which have gone out of copyright (most of them are out of copyright in Europe but only few of them are public domain in the US – although the copyright status of “The Call Of Cthulhu” in America is fairly complicated, disputed and ambiguous). This probably sounds like a really obvious step, but if you’re planning to write Lovecraftian fiction, then you should at least know what you’re trying to imitate. 2) Everything is old: Although Lovecraft was writing in the 1920s and 1930s, he generally liked to use a slightly antiquated and convoluted narrative voice. To give you an example, here is a single sentence from one of his short stories called ‘The Temple’: “My impulse to visit and enter the temple has now become an inexplicable and imperious command which can no longer be denied”. Of course, a more “modern” writer from that time period would have just written something like “I couldn’t stop myself from visiting the temple” or “The temple called to me in every moment”. Normally long-winded sentences with lots of unnecessarily long words are frowned upon in fiction, but they are essential for good Lovecraftian fiction. Plus, Lovecraft loved using words like “cyclopean” and “ichor” a lot too. So, if you’re writing Lovecraftian fiction, then it’s generally a good idea to have read at least some 19th century literature beforehand so that you have a good idea of what kind of narration people used to use back then, since this was probably one of the main inspirations for Lovecraft’s narrative style. Likewise, the settings of Lovecraft’s stories are often fairly old places which either have a disturbing history or are just generally eerie. Many of the monsters and horrors in Lovecraft’s stories are also very old too (Cthulhu being the classic example). Although some of his stories have a science-fiction elements in them (eg: “Herbert West- Reanimator”) and science is a theme in a few of his stories, scientific discoveries almost always result in something horrific happening. In short, everything in a Lovecraftian story should be fairly old. Even if you set your Lovecraftian story in the present day, then everywhere should still either have a slightly old look or a slightly old atmosphere to it. 3) First person narration/subjectivity: Quite a few of Lovecraft’s stories use first person narration and they are usually in the format of someone recounting the events which led them to the brink of insanity or the events that make them wish for death in every waking moment. Many of his stories begin in a format which is, for want of a better description, similar to a suicide note. This technique of starting after the events of the story and then working backwards is highly effective, since it makes the reader want to know what exactly has done this to the narrator. 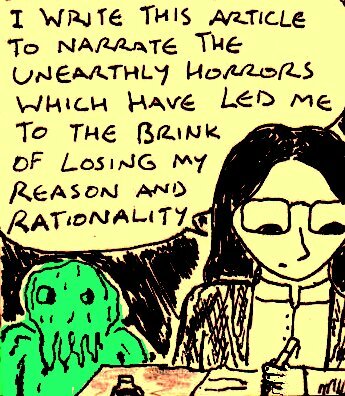 Subjectivity, sanity and unreliable narration is a major theme in Lovecraft’s stories too. His narrators often question their perceptions of events and their own sanity too. Yet, at the same time, many of his narrators value being as “objective” as possible. This tension between subjectivity and objectivity can be an essential part of Lovecraftian fiction. 4) Don’t copy Lovecraft’s attitudes: Although Lovecraft was a major influence on the horror genre, he wasn’t particularly progressive in many other areas (even for the 1920s/30s, which is saying a lot) and this sometimes shows in his stories. Whilst this may have been acceptable back in the 1920s/30s, if you’re writing a Lovecraftian story these days then you shouldn’t copy his attitudes in your story. Yes, it may not make your stories as technically close to Lovecraft’s as possible, but modern readers have much higher standards and will see your story as “a modern story written in the style of Lovecraft” rather than “one of Lovecraft’s stories from the 1920s or 1930s”. Plus, due to Lovecraft’s rather narrow-minded attitudes, there’s loads of relatively unexplored territory for new Lovecraftian stories when it comes to characters and protagonists. In other words, try writing a Lovecraftian story with sympathetic female characters. Try writing a Lovecraftian story with a narrator who isn’t a conservative upper middle class white guy. Try writing a Lovecraftian story where English and European-American culture isn’t portrayed as being “superior” to every other culture. I’m sure you get the idea…. 5) Mythos: Although I prefer Lovecraft’s more “ordinary” horror stories to his “Cthulhu mythos” stories, he invented a whole mythology of ancient gods and strange incantations which runs through quite a few of his stories. Now, you can either incorporate this mythos into your stories (although check the copyright laws where you live first), leave it out entirely or invent your own “mythos” for your stories. 6) Leave a few things to your readers’ imaginations: Although Lovecraft showed the occasional horrific or grotesque thing in his stories, the reason why so many of his stories are fairly creepy is because he left a lot more to his readers’ imaginations than many modern horror writers do. For example, although a character might visit an ominous location, there are usually quite a few parts of it that they don’t explore properly or don’t really look at in detail (eg: the narrator walking past a mysterious and gloomy pit with something moving around at the bottom of it). By leaving things mysterious and only hinting at what could be there or only showing brief glimpses of horrific things, Lovecraft allows his readers to fill the void with their own nightmares and fears. Even the gruesome parts of Lovecraft’s stories are fairly vague and leave a lot to the reader’s imagination, such as in this line from ‘The Hound’: “Then he collapsed, an inert mass of mangled flesh”. Since Lovecraft doesn’t describe this character’s injuries in graphic detail, the reader is left to work out what this character looks like – and, as such, they will probably come up with a far more horrific image than the one which Lovecraft himself was probably imagining when he wrote that sentence. So, for every horror you show, you should leave at least twice as many horrors to your readers’ imaginations. This entry was posted in Writing and tagged creativity, H. P. Lovecraft, Lovecraftian, writing. Well written; quite useful as a start for any budding author of weird fiction!